Jenny Allan from JCA Interiors offers advice on how to keep home interiors on trend this autumn. The current go-to theme for interior wall colours is grey: think winter morning grey with a hint of taupe. Its understated and sophisticated shades make it a very versatile colour that works as the optimal back drop for most rooms. Greys can be warmed or cooled depending on the combination of colours chosen and their tone will also vary according to the amount of light in a room. 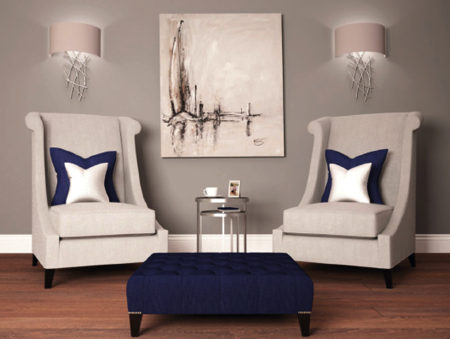 As an on trend accent colour which can be combined with grey, midnight blue is the ideal companion. Relaxing, calming and sophisticated, midnight blue is the perfect way to add a touch of colour to an interior. Use it for velvet cushions, decorative accessories or for a bolder look on walls or as a curtain fabric. Other autumnal hues that combine beautifully with grey are rusty orange tones. Think burnt orange, russet or chestnut to add warmth to a space and give a room a cosy, inviting glow. Warm tones even continue into metallics with copper and brass being the go-to metals this season. They can be implemented in varying degrees from decorative accessories to a nest of side tables or a coffee table depending on the type of interior. This autumn’s throws, rugs and cushions are plush, sumptuous textures such as faux fur and velvet which combine well with the beautiful blues and stylish greys. Choosing a mixture of soft, warm textures to layer throughout a scheme will add depth to a room. Drape fur throws over the end of a bed or sofa as the finishing touch to a room’s design. There’s an air of nature about this season’s interior design: think country home with an urban twist. With dove grey, mocha and taupe tones, materials of the moment are rustic and natural such as worn woods, chunky knits and herringbone tweeds, ideal for a cosy, comfortable autumn interior. Warm wools and traditional tartan are also very fashionable, ideal for upholstery and will combine well with other on trend pieces. Mulberry Home has some beautiful tartan accessories that will blend with every autumn colour scheme. Inspired by The Great Gatsby and Downton Abbey, art deco furniture pieces with opulent metallic tones are currently in vogue and add a certain glamour to any interior. The bold geometric shapes, often arranged in symmetrical patterns, work well in modern and traditional homes giving an atmospheric hint of the roaring twenties. Another autumn theme is the statement chair, the perfect place to curl up by the fire and read a good book as days grow colder and nights draw in. From high wing backed chairs to a simple occasional chair, a pair of statement chairs will create maximum impact and make a fashionable but also timeless addition to any home. Upholster in tartan, herringbone tweed or fine wool to create the ultimate autumnal design piece. This autumn’s interior trends will suit all types of homes making September the ideal time to redesign and transform an interior. 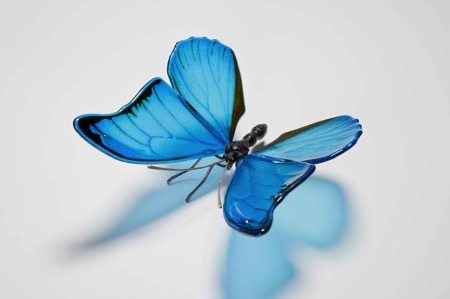 Suffolk artist and designer Laura Hart specialises in the creation of sculptural glass art, and has a particular penchant for exotic orchids and butterflies. Recently an American collector bought her unique butterflies just 24 hours after appearing in London’s Vessel Gallery, Rebecca Peters found out why. With a background in 3D design and animation, Laura Hart has designed large-scale public sculpture for concept artists, stage sets for pop stars and vast props for sporting events, but her true passion lies with hands on creation. 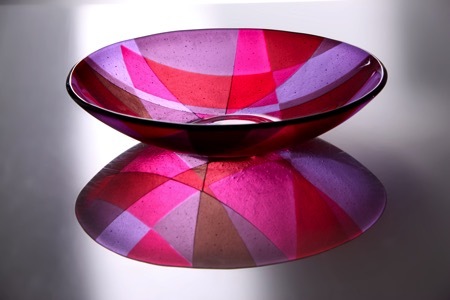 Laura first encountered glass art in 2009 whilst designing a sculpture requiring glass components. To better understand the fabrication processes she observed glass artists at work and was immediately captivated. “The versatility of glass is legion; so many disciplines have evolved to craft this delicious material into infinite forms, I wish I’d discovered it years ago,” she says. A dedicated arts and crafts revivalist, Laura’s work combines fine art and functionality in true Nouveau and Deco styles, particularly favouring the use of ambient lighting. 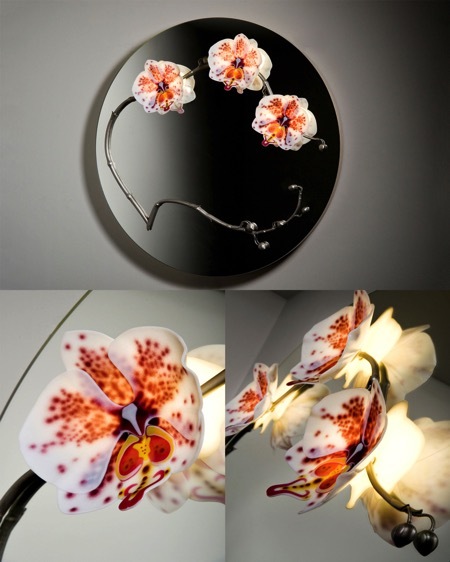 Her 1,200mm diameter orchid mirror is dressed with three delicate moth orchid flowers set on a gently curving stem, each flower glowing with subtle backlighting hidden behind the mirror. She offers her clients a complete design service, providing virtual images of the commission in situ within their home prior to creation. Laura has so far added six orchid species and several lily and poppy varieties to her flower anthologies. Emulating the delicacy and ethereal translucency of real blooms, she layers the flower structure as it forms in nature, employing several traditional glass making techniques to meticulously create fine detail. Backlighting reveals every gossamer facet through the petal layers in a diffused spectral glow. In a natural progression from exotic flora, for 2015 Laura has shifted focus onto colourful fauna with her Lepidoptera series; painstakingly detailed butterfly specimens from around the globe. Scaled up to an eighteen-centimetre wingspan, the glass insects are created from multiple fused wing-sets, pate de verre cast bodies and sterling silver legs, antennae and proboscis. Mounted in bespoke wall hanging cases, her first five specimens were exhibited in the window of London’s Vessel Gallery during early May this year. Twenty-four hours later the entire collection was purchased by an American collector and within a week fluttering their way Stateside. Laura is busy creating several more unique butterflies in readiness for the prestigious Decorex interior design exhibition in Syon Park, London, from 20 to 23 September. 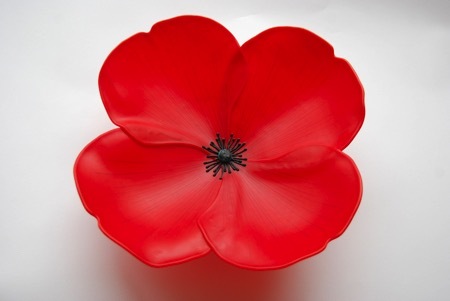 Vessel Gallery is preparing a stunning display of the new pieces for its stand, number B23 for those planning a visit. In stark contrast to her nouveau style flora and fauna, the Deco-esque flip side of Laura’s creative flair is precise optical geometry, attributing her ‘Picasso’ collection of vibrant bowls and vessels to her love of the great artist’s painting, ‘Ma Jolie’. “Picasso’s early cubist works were inspirational; suggestive, secretive and playful. My intention was to create functional pieces that reveal their secret when light passes through the layers of colour: casting a ‘painted’ image onto the surface upon which they are displayed,” she says. Founded in Notting Hill, London in 1999, Vessel Gallery is a major destination for the appreciation of contemporary art-glass sculpture and decorative lighting. From the stunning simplicity of Scandinavian crystal, via flamboyant Italian art glass, to the best of British and international creative talents, all pieces are unique or limited edition and have been carefully edited to show an unparalleled selection of contemporary design and craft. The Gallery also edits its own editions, and has an ongoing programme working with emerging and established studio artists and designers, producing unique collections of exclusive limited edition art works in glass and other materials. The majority of the collections are handcrafted by the artists and designers in their studios, but also involve collaboration with skilled craftsmen worldwide. The Gallery also consults for interior and corporate projects, providing the opportunity to have a truly bespoke commissioning service with unique works created in dialogue with a client. 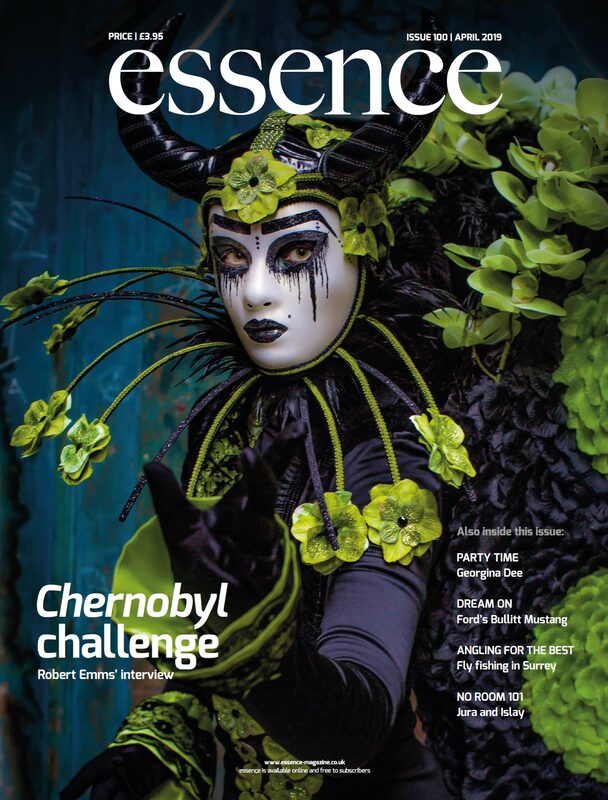 In addition the Gallery is a valuable resource for artists, museums and collectors. Numerous artworks have entered prestigious public collections as a direct result of the Gallery’s exhibitions and advocacy.